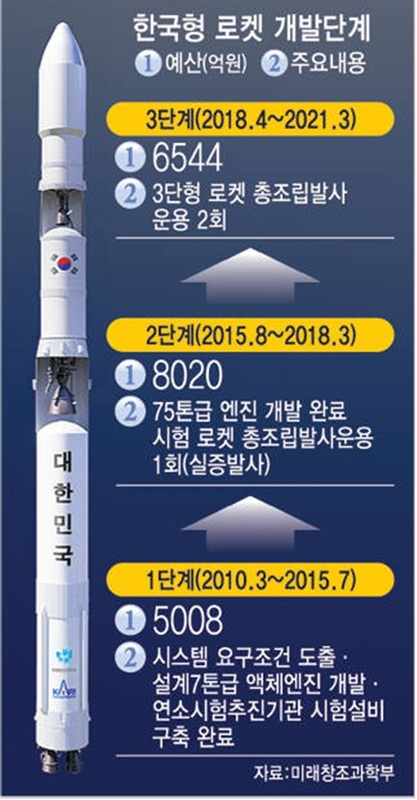 The 2nd development project for Korean rocket (projectile) will start in August. 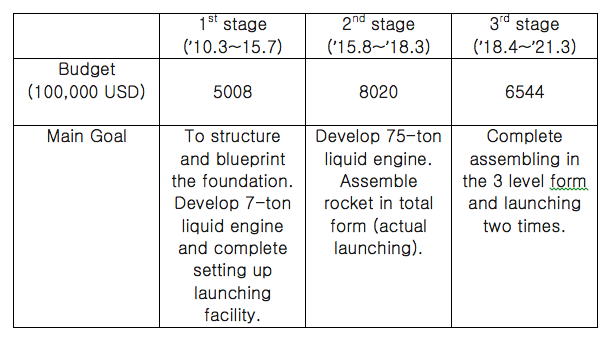 2nd level targets developing a 75-ton liquid engine, which is the the main technology for Korean rocket, and thus will be investing 732 million USD until 2018. Ministry of Science, ICT, and Future Planning (MSIFP) plans to finish the 1st level development and evaluate by upcoming July and start the 2nd level development in August. The project goal is to develop a 75-ton liquid engine and successful launch test according to it. The Korean rocket will have 1st level engine that has four 75-ton liquid engines tied together, 2nd level engine with one 75-ton liquid engine, and 3rd level with 7-ton liquid engine. The 75-ton engine that used in 1st and 2nd level is the most important factor for deciding the success in developing Korean rocket. MSIFP will complete the rocket and engine detailed structuring via 75-ton liquid engine developmental testing and ground firing test. The Korea rocket development project is a huge R&D project that has been ongoing on since 2010 and planned till 2021 with 1.8 billion USD investing cost. The goal is to be able to technology to rocket launch 1.5 ton level working satellite into 600~800km Earth’s lower orbit via 3 level 300-ton (4x75-ton) satellite rocket. Once the technology development is complete, 3 level satellite rocket flight model will be made for satellite testing, and go through 2 launching testing in 2019 and 2020.